HIDEOUT is up to bat this time on 19BOX RECORDINGS. His work is well known as one half of Hot*Dog and HOT STATION and makes his home run swing with the 'Pray 4 Japan EP', following his collaboration with to Sweden's JELLYMAZE(aka BJORN FOGELBERG) on 'Hide And Seek'. 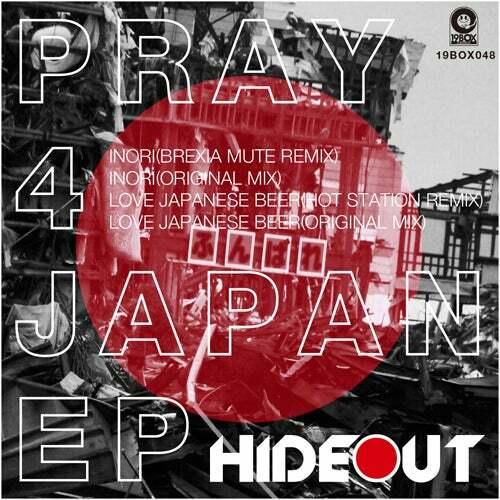 After experiencing the massive earthquake and tsunami that shook Japan on March 11, 2011, HIDEOUT was inspired to produce this track. The Japanese word "inori" means "pray" in English. This tragedy provided a new outlook on life and further inspiration to produce music. This was first featured on "Essence - Paradise Sessions". After its appearance there, we decided to release 'Inori' as a single EP with remixes. Love Japanese Beer, which focuses on the history of Japanese beer, was also featured on "Essence - Resort Sessions". Remixes duties come courtesy of BREXIA MUTE from Argentina and HOT STATION. BREXIA MUTE remix has been rebuilt to suit the dancefloor. HOT STATION added funk phenomenon to the original. This is a testament to the strength of Japanese culture, it's people and that we don't give up in the times of duress!! !